This astonishing encounter between two killer whales and a large creature with a trunk and white fir first appeared in an article called ‘Fish Like A Polar Bear’. Published in the Daily Mail on 27th December 1924, the article described a strange creature lifting itself out of the water by 20 feet and whacking the whales with its tail. Hugh Balance, one of the witnesses, claimed that the animal was like a “giant polar bear”, and that the whales were said to have fought the creature for three hours. 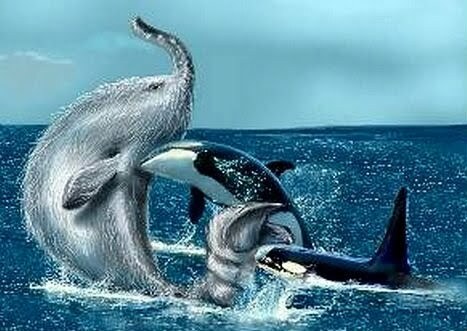 Trunko versus two killer whales – who won? After the fight, the carcass of the creature – nicknamed Trunko – washed up on Margate Beach. Apparently the whales won the fight. Trunko was there for 10 days before getting dragged back into the water, but no scientists examined it while it was beached. Unidentified witnesses described the corpse as being 14 metres long, 3 metres wide and 1.5 metres high, having white fir, a lobster-like tail, an elephantine trunk and no blood. A question arose over whether Trunko was really dead following an article published on 27th March 1925 in the Charleroi Mail in Pennsylvania, called ‘Whales Slain By Hairy Monster’. This story reported that, in contrast with the first article, Trunko killed the whales. He then swam ashore, fell unconscious from exhaustion, woke up 10 days later and crawled back into the sea. Since 2010, cryptozoologists have been digging up photographs taken of Trunko when he was washed up on Margate Beach. Having viewed the photos, Karl Shuker determined that Trunko was a globster. For a long time, globsters or blobs (that’s the technical term) were unidentified organic masses that washed up on beaches and often lacked bones, heads or recognisable body structures. 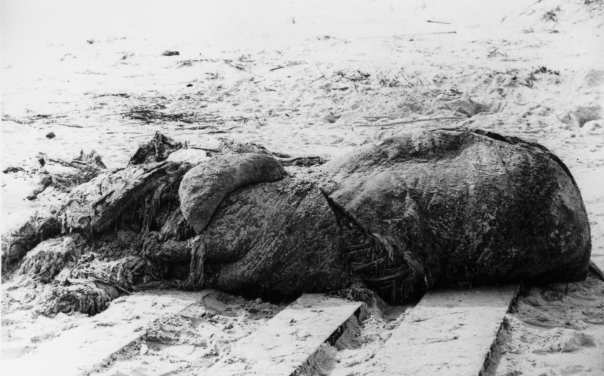 One of the earliest examples is the St. Augustine Monster, a strange, rubbery mass that washed ashore near St. Augustine in Florida in 1896. Scientists at the time theorised that the St. Augustine Monster was the remains of a gigantic octopus – an unverified cryptid in itself. However, recent, more advanced analysis of samples taken from the carcass has confirmed that the monster was a decaying mass of whale blubber, probably from a sperm whale. This tends to be the 21st century explanation for most globsters. On looking at the photos, Shuker decided that Trunko was nothing more than whale blubber, and that its white ‘fir’ was just exposed connective tissue fibres. If Trunko was indeed just a mass of decaying whale skin, how does that explain Trunko’s battle with two killer whales, which was observed by witnesses on Margate Beach? Well, orca enthusiasts will know that killer whales have a rather charming habit of playing with their food. They’ve been known to toss seals in the air and repeatedly whack them with their tails while they’re still alive, and continue to do so after the seals have croaked. 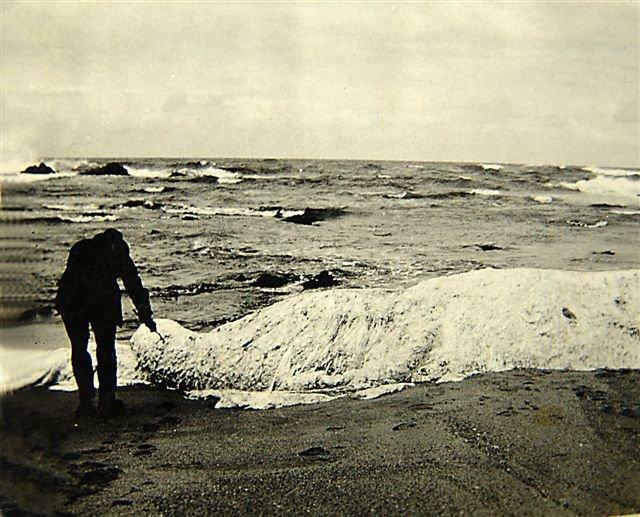 So Karl Shuker’s theory is that the two whales happened upon this mass of decaying blubber and were playing with it, tossing it into the air and confusing observers on Margate Beach into thinking it was alive! Next week: Were the moon landings faked? Previous postWhy is 2011 Princess Diana documentary ‘Unlawful Killing’ still banned? Next postWere the Apollo moon landings faked? A few people have mentioned this new photo! I will look into it – could be great material for a follow-up blog! Thanks! I hope you enjoy the rest of the site 😊.